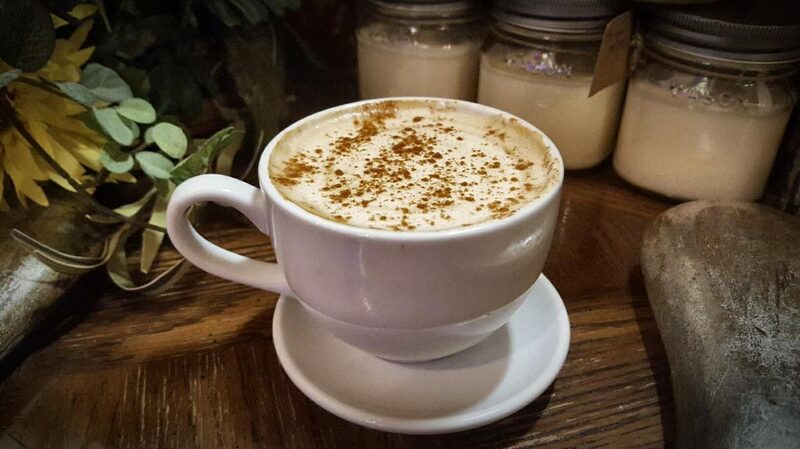 Stop by the Coffee Cottage for unique seasonal drinks like this custard latte–with a blend of eggnog, vanilla and cinnamon to put you in the holiday spirit! Photo Credit: @thecoffeecottageco via Facebook. The Coffee Cottage is new in town, but has already found a special place among the locals. 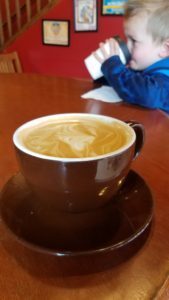 They boast all organic coffee and pastries hoping to appeal to a health-conscious niche market in the small town of Woodland Park, but they succeed in serving great coffee to everyone who walks through the door. Located in the group of shops near City Market grocery store, you’ll find them under the “coffee” sign near another Woodland Park favorite, AJ’s Pizza. All organic and locally made. These “poptarts” are yummy and kid-approved. Their owners take pride in their work and the things they offer; they have some unique treats as well as many of the coffee shop staples you’ve come to expect. But their coffee roast has a unique flavor that will mix up your normal order. 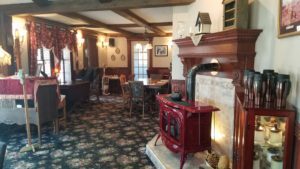 We’ve had several things from the Coffee Cottage including cappuccinos, lattes, flavored drinks, unflavored drinks, iced, hot–you name it. I think it’s well balanced and smooth, but the coffee they use has a hint of a smokey taste. It makes me feel like sitting around a campfire with a warm blanket and a warm cup of joe! 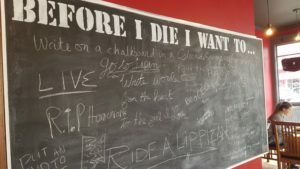 I really like it, and because I only stop by when I’m “up the hill” – as those of us from Colorado Springs say when we visit the mountain towns up Ute Pass – it’s a pleasant surprise every time I return. 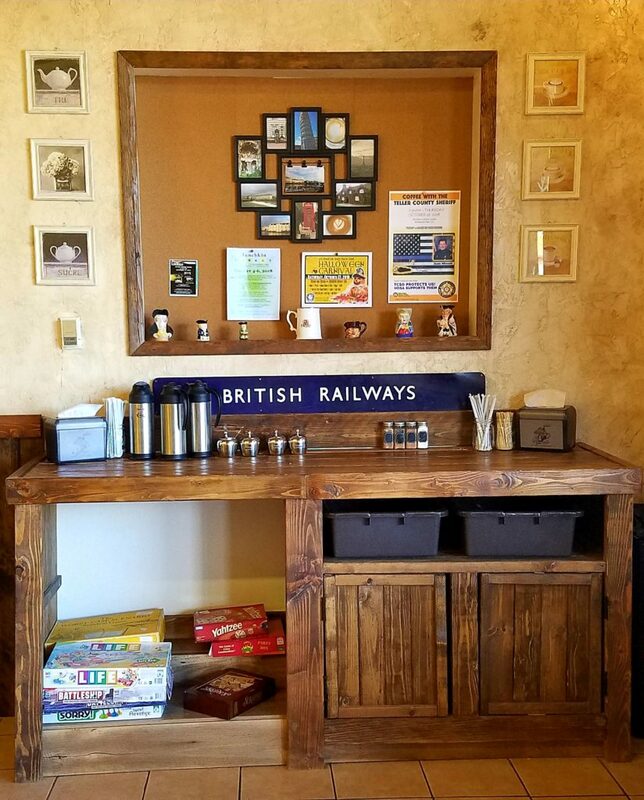 Have your coffee or tea your way, then grab a board game for some old-school fun. The shop continues to grow; this is their first year in town, so they’re still getting settled. And I’ll be interested to see how the shop evolves and flourishes. The shop is filling in, and there are several regulars who use the space to study, have meetings or sit and relax. The Coffee Cottage also has a strong community mindset by lending a helping hand to other small creators in the area by displaying and selling local crafts, jewelry as well as other products. I give the Coffee Cottage an 8/10. A solid score for their first few months in business. Drive Through: No – plenty of free parking, though. Kid Friendly: Yes – they can whip up a mean hot cocoa and there are some toys and games to play with, too. They really want everyone (even busy working moms with kids in tow) to stop by. 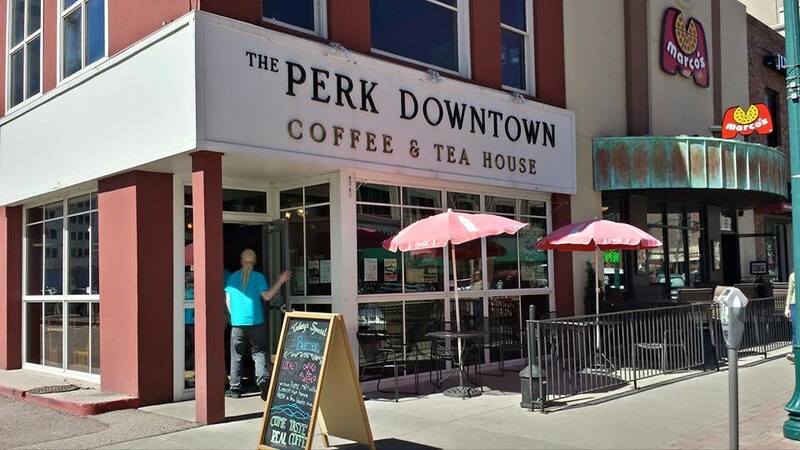 The Perk Downtown is located off of Tejon Street in the heart of Colorado Springs. Photo: @ThePerkDowntown via Facebook. Colorado Springs is home to great coffee, and the Perk Downtown is a prime example. This fun and bustling cafe has great drinks and food which rank among the best in town. As you might expect, it’s located in the heart of downtown Colorado Springs on Tejon. Tejon Street is home to lots of local shops and restaurants as well as being the premier route for all parades and downtown celebrations. Add to the chalkboard while you’re there. The location creates a fun atmosphere because there are always people there with you. It’s energizing, and not just because of the caffeine! We went for the first time on a cold spring day, and it was easy to get warm inside. In warmer weather, it’s fun to sit outside and people-watch on Tejon Street, or there’s seating upstairs and on the roof for better views. Our kids had a great time! We took our kiddos and they had some hot cocoa while we had coffee. And I have to give props to the staff for understanding the habits of 2- and 4-year-olds. The cocoa came in to-go cups with lids. Parents get it. Lids. The best soy latte I’ve ever had. I’ve tried to replicate it at home, I’ve tried to find a better one in town. So far, I can’t! For those who don’t do dairy, I had a soy latte that has yet to be topped. I’ll just throw this out there too, they serve cocktails. Bloody Marys and mimosas (among other things), for those of you who may be interested. We give The Perk Downtown a 10/10. Great location, great options and fun atmosphere. Drive Through: No – Parking meters in the downtown area take credit cards, and are free before 8 am and after 6 pm, Monday-Friday. They are free all day on Sundays and city holidays. What better way to embrace Colorado in all its glory than to dine on locally grown food? Ladies and gentlemen, it’s farmer’s market time. I can’t tell you how happy this makes me. Please promise me you’ll try some Palisade peaches before you go home. Colorado Springs Flea Market, 5225 E. Platte Ave; 7 a.m. – 4 p.m.
Spencer’s Lawn & Garden Center, 1430 S. Tejon St.; Monday – Saturday 9 a.m. – 6 p.m.
Information from Teller County Farmers Market Assoc. There is a summer farmers market in Woodland Park, in Memorial Park / Henrietta Avenue near the Cultural Center. The market begins the second Friday in June and goes through September. You can park across from City Hall on South Avenue, at the Senior Center (please leave spaces for seniors close to the building), next to the Ute Pass Cultural Center, in Bergstrom Park off Hwy 24, and at various public parking lots in downtown Woodland Park. It’s easy to park on a residential street and walk to the farmers market. 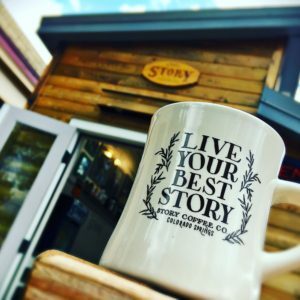 Story Coffee–self proclaimed “first tiny house coffee shop in the world”– is located in downtown Colorado Springs on the edge of Acacia Park. 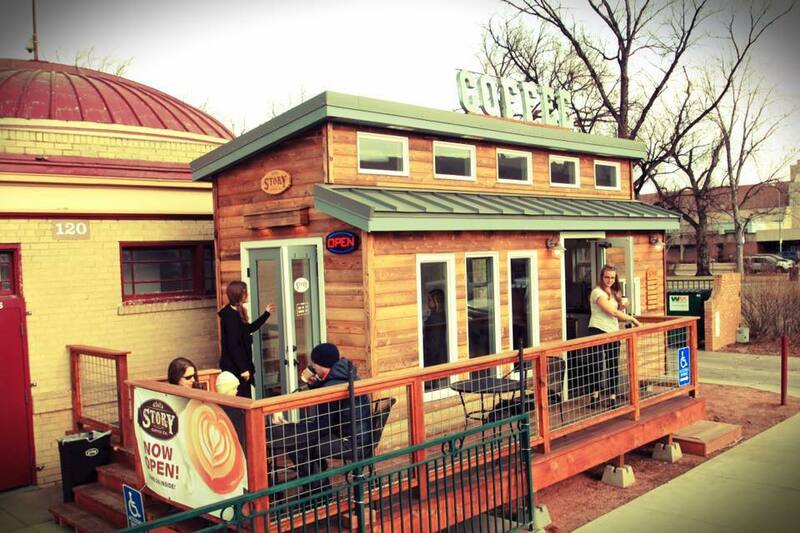 And it’s exactly what you’d think when you hear “tiny house coffee shop.” It’s tiny. The interior is wide enough for two people to stand side by side and place their orders at the counter, and long enough for a few more sets to stand behind. It’s definitely not big enough for my 4- and 2-year-olds to run around like they wanted. But that’s the point. The splash pad in Acacia Park is right next to Story Coffee, while the rest of downtown unfolds behind the park. The owners of Story Coffee have lived the minimalist life for years. They sold their house and most of their possessions and hit the road with their two kids, collecting memories and mileage instead of stuff. They traveled the country exploring as a family, tasting great coffee, and learning from coffee shop owners from coast to coast. The shop used to live in a different part of the Springs, until a few years ago when it was “parked” near Acacia Park during the busy holiday season as a test run. And Acacia Park has been the home of Story Coffee since. The shop has a lovely deck if you want to sit. 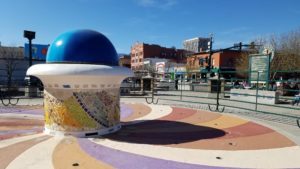 Because it’s inside the park and so near downtown, the setting encourages you to talk to other people while sipping your coffee or set off to explore downtown. 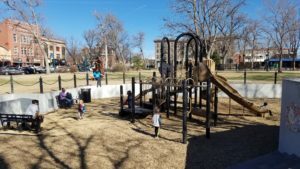 The playground is great for the little ones while mom and dad fuel up with some caffeine. Our kids loved playing on the playground while my husband waited for our coffees. In the summertime, Acacia Park is packed because they turn on the splash pad, and kids can’t get enough. Concerts are put on just behind Story Coffee on the outdoor stage. Also, Tejon Street has shops, restaurants, and it’s the parade route for every event in the Springs. My coffee was hot, smooth and light. It was the perfect thing for walking on a bright spring day. They sell some pastries but don’t have a full kitchen, so you won’t be able to order a full meal. They don’t have a huge variety, but the things they do, they do well. The shop is popular, so the line is long. There was only one person working when we were there, so things took a while. But remember, their shop has limited square footage. There’s not enough room for lots of employees. But it was worth the wait. All in all, we give Story Coffee a 9/10. Drive Through: No. And if you park on a weekday, many streets have parking meters (but the meters take credit cards). My Sweet Escape Bakery and Cafe is on the corner of Highway 24 and Elm in Woodland Park’s Gold Hill Square. My Sweet Escape is a cute bakery on the corner of Gold Hill Plaza in Woodland Park, Colorado. 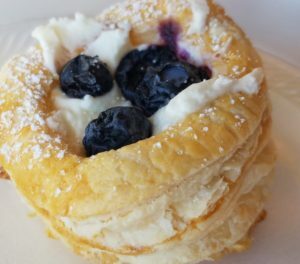 As the name suggests, the shop is full of yummy baked treats from cupcakes and cookies to flaky pastries filled with berries and cream. Needless to say, if you leave unsatisfied, it’s your own fault. 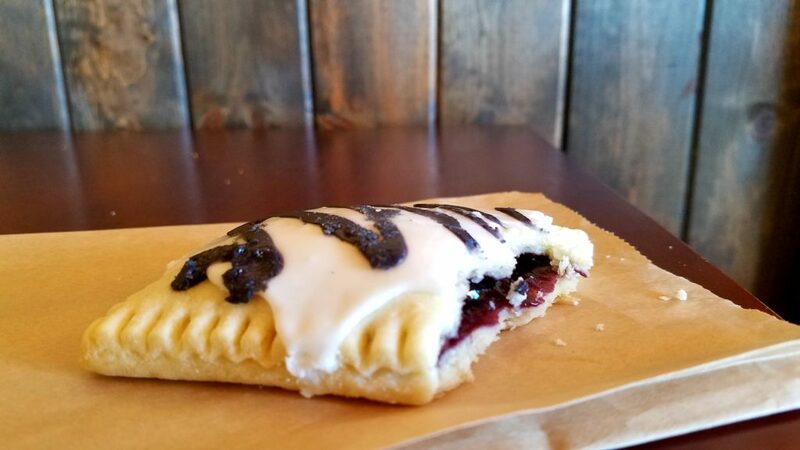 Not only does My Sweet Escape have many bakery favorites, it also has a full menu from stews, sandwiches and great sides, to their famous Czech kolaches and hamburgers. 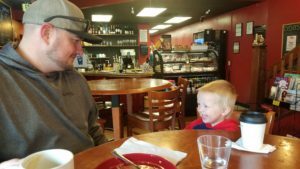 We went with our kids, then drove on to Mueller State Park for a day of exploring. 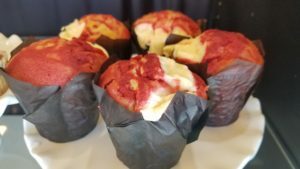 Red Velvet Cream Cheese Muffins! 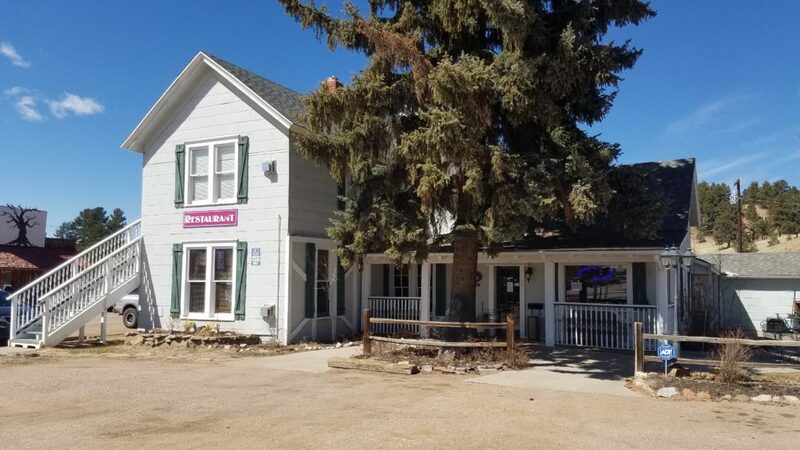 Costello Street Coffee House was renovated from the historic McLaughlin House in Florissant, Colorado. The house was built in 1885 for the McLaughlins, a prominent family in the area, who lived right next door to the founders of Florissant, the Costellos. Be careful, don’t blink! If you do, you might miss all of Florissant, Colorado, on your way through. Like many mountain towns throughout Colorado, the bustling metropolis of Florissant is comprised of a small cluster of shops. If you’re not paying attention, you might pass it by. However, this small town, located at the intersection of Highway 24 and Teller County Rd 1, is worth slowing down for. It has a convenience store and gas station, so it’s a good place for a pit-stop. But it’s also home to some great food. The Victorian style of Costello Street Coffee House makes it unique and homey. Get cozy by the fire with your drink of choice. Costello Street Coffee House is a fun place to stop and refresh. 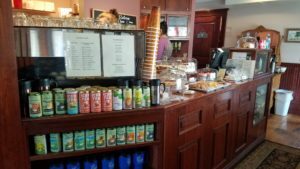 The historic McLaughlin House in Florissant now serves steamy cups of coffee and tasty treats, while maintaining the cozy feeling of going home! The home was built in 1885 for the McLaughlins during the height of the Victorian era. The McLaughlins were a prominent family in the Florissant area, and the interior reflects their Victorian style to this day. Costello Street Coffee House has a full menu if you want a bite for lunch, or you can grab a pastry to go. You’ll find all the staple coffee-shop drinks. I got a chai tea. I’m not usually a fan of chai, but this was tasty. To me, chai tastes like Christmas. It has the same smell as the boxes of Christmas decorations we unpacked each year. I think that’s why I don’t get it often; it seems out of place in months that aren’t December! But I can definitely see myself coming back around Christmas for another chai tea while getting cozy in front of the fireplace. They have a full menu as well as delicious pastries to choose from. 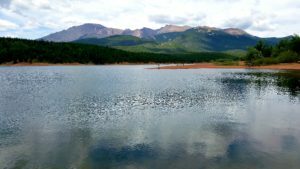 Florissant is an hour from Colorado Springs, and an hour and a half from Breckenridge, so it works as a perfect midway point. Pike National Forest, The Florissant Fossil Beds, and Mueller State Park are all 10-20 minutes away. You can stop by Costellos to grab some breakfast before venturing into the Pikes Peak area. 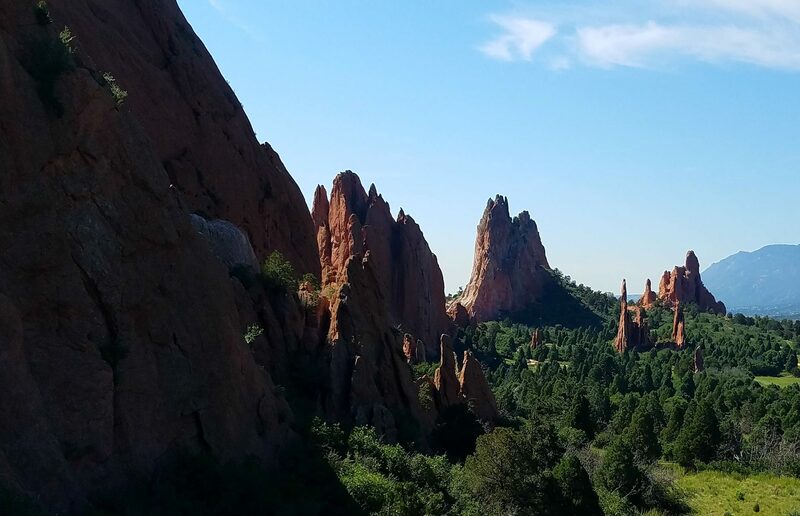 Then finish your day by exploring Colorado Springs and Garden of the Gods before heading back up Ute Pass and into the mountains surrounding the Florissant area. All in all, I give Costello Street Coffee House a 6/10. I don’t think they have a lot of unique things to offer, but what they have is consistent and good. It’s definitely worth checking out, especially if you’re staying in our Florissant Family Retreat, only 10 minutes away! Pikes Peak with a light dusting of snow, as seen from Woodland Park, Colorado! Fourteen thousand, one hundred and fifteen feet! Woah! 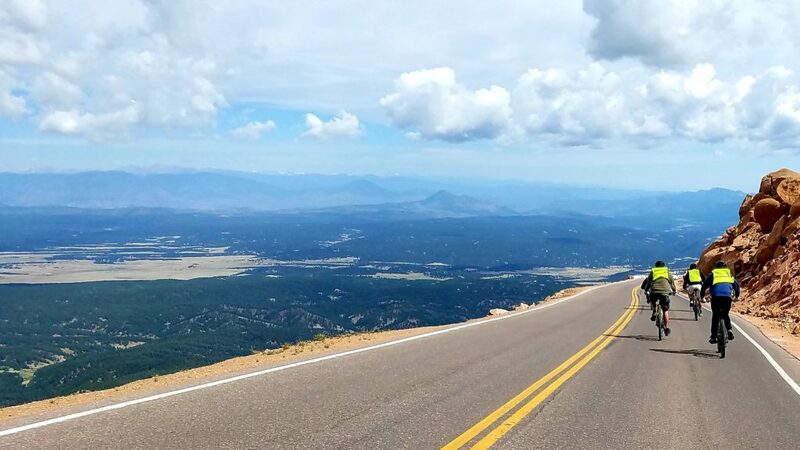 Pikes Peak, America’s Mountain, stands over 14,000 feet above sea level, and it towers more than half that distance above the towns at its base, including Colorado Springs, Manitou Springs, Cripple Creek, Cañon City and Woodland Park. 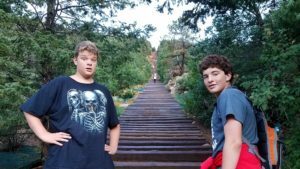 These are our nephews on their first time up the Manitou Incline. It’s finally hitting them what they’re about to do. As an above-14,000-foot peak, it’s part of the group of mountains known as fourteeners. 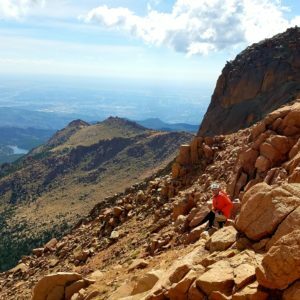 Colorado has 54 fourteeners, and Pikes Peak ranks 31st out of those 54. 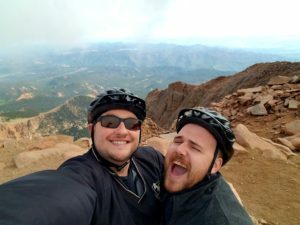 Conquering the summit of Pikes Peak is truly an achievement. 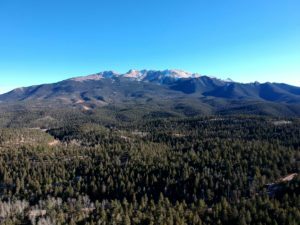 Pikes Peak was discovered in the 1700s, but wasn’t named until an excursion brought Zebulon Pike into the area. 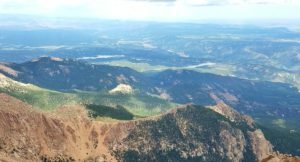 Later, Katherine Lee Bates would write a poem describing the beauty of the American countryside, and the “purple mountain majesties” were based on none other than Pikes Peak. America’s Mountain was born. Locals can attest to the purple hue of the mountains in the early morning sun, and they always look for “the Peak” to know they’re close to home. 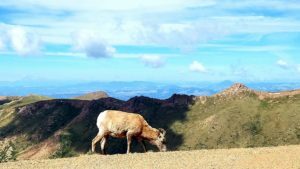 Whether you’re hiking, biking, driving or taking some great Colorado photography, it’s a must-see attraction. A view from the Pikes Peak Tollway! …you begin at the Pikes Peak Tollway in Cascade, Colorado. It’s a 19-mile journey that will take several hours round-trip. It will take your breath away as you navigate the switchbacks to the top. Be prepared for the journey with some snacks and water for the car. You may notice that you get sleepy along the way. That’s the altitude! Also, be prepared for a 30-degree temperature drop. Even in the middle of summer, it can be cold on the peak, so bring a coat! Make sure to get some fudge at the top in the gift shop. It’s so yummy! HOURS: 9 a.m. – 5 p.m. Daily | Last car goes up at 3 p.m. The hike is not for the faint of heart. When you think you’re almost there, you still have a ways to go! This view is just below the half way point on the Manitou Incline. The Barr Trail begins in Manitou Springs. 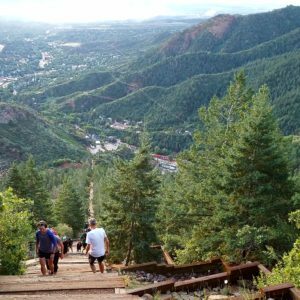 You can begin with the infamous Manitou Incline, a set of over 2,700 stairs that gain 2,000 feet in elevation in just under a mile. Not ready for that? You can jump right on the Barr Trail. The trail is 13 miles and gains 7,510 feet from beginning to end. You’ll want to begin in the wee hours of the morning because it can take more than 4 hours just to get half way! Many hikers choose to make the trip to the top a two-day trek (that’s my most alliterative sentence, to date). Barr Camp is about 7 miles from the trailhead. You can make reservations to stay overnight at barrcamp.com/overnight.php. Or rather, bike down. 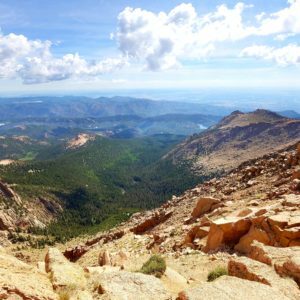 You can book a Jeep tour to the summit of Pikes Peak. You’ll meet in the morning for a yummy breakfast, then take a Jeep to the top! Once you’re there, there’s only one way down, right? Cruise down 19.5 miles of scenic highway back to Cascade, and end at the Wines of Colorado for a lunch to celebrate your return! 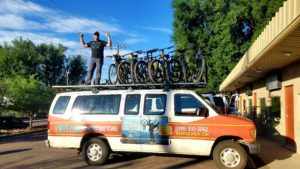 Book at tour at pikespeakbybike.co. Pikes Peak rises out of the trees near our Catamount Cabin. 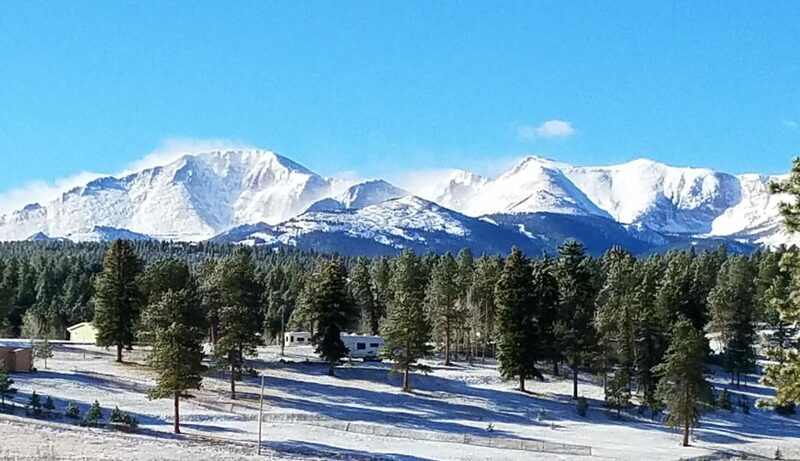 At the end of your incredible day, kick back and relax at our Catamount Cabin in Woodland Park, which looks right out on the majestic mountain you just explored, or our Family Retreat in Florissant which, at almost 9,000 feet is nestled in the heart of this great countryside. For weather & road conditions on Pikes Peak Highway, call 719-385-7325. KaPow Comics & Coffee is a fun and geeky place to get a cup of Joe. KaPow is an easy hole in the wall to miss. 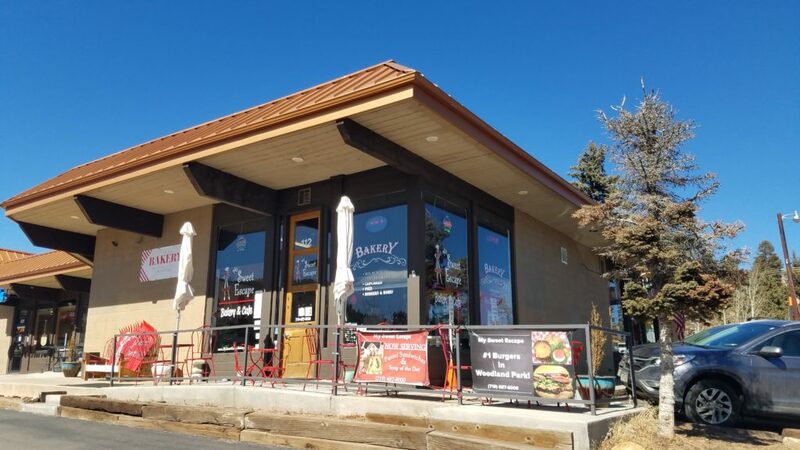 It’s a small shop located on North Nevada Avenue near the Colorado Springs campus of the University of Colorado. It’s a few minutes from the Historic North End of Colorado Springs and downtown, as well as local favorite hiking area, Pulpit Rock. 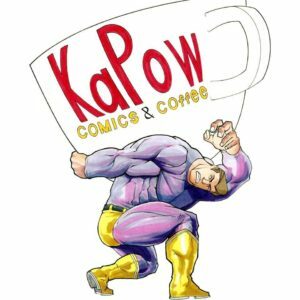 Comic lovers rejoice, KaPow Comics & Coffee is connected to a full fledged comic shop with titles from several genres as well as miniatures and collectibles. The inside of the building is lined with bold colors and art from local artists. KaPow uses coffee exclusively from Coda Coffee Co. Coda hails from Denver, and they are a certified B corp. Meaning they adhere to strict social and environmental standards. The cafe does local sales and specials for their brews and books alike, local artist showcases, and trivia and game nights. 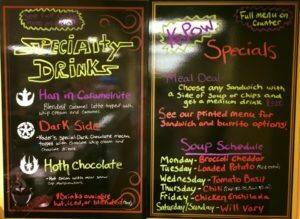 They have all of your favorite traditional coffee drinks as well as a full menu and specialty drinks with a nerdy twist! I tried a plain Jane latte, and it was so smooth and good. Aaron tried the Han in Caramelnite and won’t stop talking about it! I think George Lucas would approve. The only downside to KaPow is not many people know about it. It’s a little quiet inside on any ol’ day, but it fills up for special events. All said and done, we give KaPow 8/10. Drive through: Yes! Satisfy your inner geek on the go!